Penelope Thompson is an Australian contemporary artist working internationally. Her work includes outdoor and indoor installation art , performance art, and interactive community art events. Installation art is usually a temporary art form, where the artist constructs or arranges objects and various media such as video, music, sculptural pieces, textiles etc. in a gallery, public place or outdoor setting. The aim is to provide the viewer with a special, often multi-sensory, experience in the particular space, such as Thompson's outdoor installation artworks on Jeju Island, Korea. Penelope's indoor art installations include 'artists' books' such as 'The Book of Bright Ideas' 2006, - constructed from electric light and paper, and 'Treasure'. The 'Canadian Survival Apron' (see photo right) was made by the artist during a trip to Canada in February 2006. This work is now part of a large ongoing international travelling 'apron art' exhibition, that has been shown so far in various galleries across Korea, Canada and Australia. Earlier works include a community 'wishing tree' called 'The Beautiful Changwon Tree' that Penelope set up in April 2004 in a large public gallery in Korea. This followed her first Korean art installation of 'Portrait of a Foreign Artist in Korea', (see photo left) in February 2004 at the Sungsan Art Hall, Changwon. 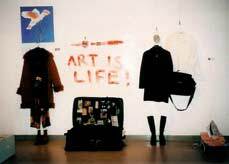 This installation was combined with a performance that commenced with the artist emerging from the zipped-up suitcase. The performance and installation attempted to express some of the challenges experienced by a foreign artist 'living out of a suitcase' in Korea. July 12-20, 2009. Installation and performance Matsushiro Contemporary Arts Festival, Nagano, Japan. "Interchange"- installation and performance, MCAF 2009, Japan. To see takes time, like to have a friend takes time. Georgia O'Keeffe.